The Black-legged Kittiwake is the most abundant gull species on the planet with an estimated 6 million pairs as of 2004 (Olsen). It has a fragmented breeding range that extends almost entirely over the Arctic Cirlce and other regions of the upper northern hemisphere. It nests in copious colonies, primarily on steep cliffs that overlook the ocean. This species is truly pelagic, evidenced by the months it spends out at sea after the breeding season. It's commonly seen on pelagic trips off the west coast and small groups can also be seen from shore when strong winds force them east, sometimes grounding them on beaches in California. Juvenile Black-legged Kittiwake, 20 December 2009; Port Washington, WI. Amar Ayyash. In the interior, the Black-legged Kittiwake is known for mobilizing birders, including myself, as this species is rare to casual away from the west coast. This season has been an unprecedented one, producing several record-breaking sightings for South Dakota and Indiana. Ricky Olson and Kenny Miller reported 7 BLKIs (6 juveniles and 1 adult) on 21 November 2010 out of Pierre, South Dakota. This area gets no more than 2 BLKIs per year and some years none are reported at all. Adult Black-legged Kittiwake, 27 November 2010; Oahe Dam, SD. Likely of the nominate race tridactyla, based on the reduced black in the wingtips and full band on P6. In late fall, BLKIs are regularly seen during lakewatches at the famous Miller Beach in Indiana. The lower Lake Michigan birds usually come in with stiff northwest winds and no more than 1-2 are expected on a "good" day of lakewatching. On 18 November, Ken Brock and company reported 26 individuals (all juveniles) in Gary, Indiana - I've yet to find an inland record greater than this! In Illinois, BLKI is usually unrecorded in spring and rare but regular in late fall to early winter - it's a very rare winter resident. It's not uncommon for this species to go unnoticed on the Chicago lakefront in some years. The last several months have been superb with at least 6 sightings along the Illinois lakefront from November-February and more than twice that on Indiana's lakefront. I had a personal high count of at least 3 juveniles on 18 November looking into Indiana waters from Calumet Park. Currently, there is a wintering 1st cycle bird being seen on-and-off at Montrose Beach and another at Calumet Park. 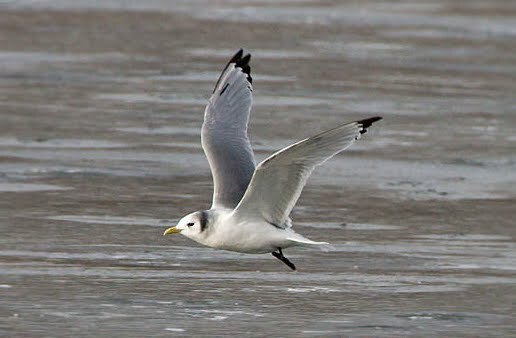 It's very likely that more than two kittiwakes are roaming the Chicago lakefront and it's also very likely that these individuals are a product of the November flock seen at Miller Beach in Indiana. Juvenile BLKI, 23 January 2011; Hammond Power Plant, IN. Amar Ayyash. This description given by Chicago birder Bob Hughes wonderfully describes one of the reasons why this species is truly a majestic marvel: "It's pretty amazing how far these Lake Michigan Black-legged Kittiwakes have come and the journey they took to get here. They were probably born far above the arctic circle in northern Canada, possibly alongside nesting Northern Fulmars and Thick-billed Murres. When they were ready they left their nests and flew south, probably down Hudson Bay, where they may have flown over a pod of Beluga Whales or were harassed by Parasitic Jaegers. Maybe they saw a Polar Bear or two. At some point they had to fly over land which means crossing the expanse of the boreal forest in Ontario or Manitoba. Once they reached the Great Lakes it was a hop, skip, and a jump to Chicago". Same bird as previous photo. ﻿If you've never seen a Black-legged Kittiwake, then get out and find yours. This is certainly the year to score one - or two! Pale Thayer's or Dark Kumlein's?